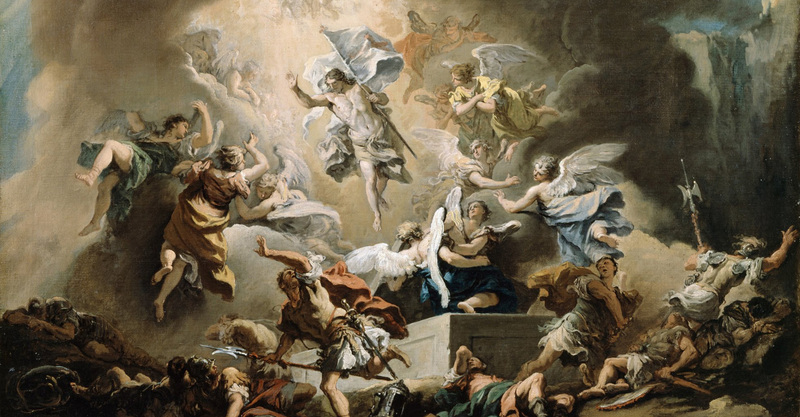 The Experience of the Resurrected Christ: A Divine Dream Worth Dying For. The dream of God is a dream of unending, divine love. His only Son, our Lord Jesus Christ, sacrificed his human life for this Dream: the redemption of humankind and the gift of eternal life and perfect happiness. Heaven is the divine dream that is not a fantasy but reality! Its gates are open through the resurrection of our Lord and Savior, Jesus Christ. How often have you asked yourself what you want in life? It is culturally American to, in one’s early adult years, develop some type of life-plan that includes career, marriage and family choices—although marriage and family plans are, unfortunately, often today eclipsed by career plans. One’s life-plan often develops into a life-dream when a dose of the imagination is added. It is likely you grew up with a dream in mind that included a strong measure of success and happiness, perhaps even prestige or fame with a few gallant victories and sword fights mixed in, but it didn’t turn out as you had imagined, did it? You didn’t kiss Sleeping Beauty and the Princess didn’t marry the Knight in Shining Armor. Then the questions began. The questions are no longer so much about what you want in life, but about what life is. No. This is not all there is. Christ is risen! 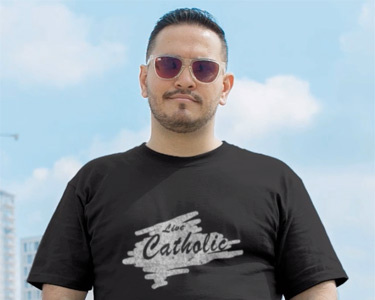 You might say, “Because I was baptized one,” or “I was raised that way,” or “I like the liturgy,” or “My wife makes me,” or “I’ve never really thought about switching colors,” or “I want to go to heaven.” These are good answers, perhaps, but they don’t get at the heart of why you, or anyone else for that matter, should be Catholic. The reason you are Catholic, whether you know it or not, in fact, the reason why God created you, is to experience the divine presence of God and to lead others to open their hearts to that experience of the supernatural. That you were made to receive divine love is true. God created you not only to share his life with you and to bestow upon you a share in his divine nature, but to fill you with indescribable happiness and unending supernaturally-infused bliss. Trust me, this is far, far above and beyond any type of material or worldly based—and therefore fleeting—source of pleasure or temporary happiness. And God wants you to enter into his plan in such a way so as you become his instrument of glory. You are called to invite and bring others into the reception of divine love, the heavenly wedding feast of glory. You are invited to make sacrifices, to give of yourself, to evangelize and to infuse the world with Catholic principles. You are called to become a “little christ,” empowered to do so by the resurrection of Christ. You’re not going to get to heaven alone, without bringing others with you. In the end, it is not about you, not completely. The cross—yours—is there and waiting. That is something you have to get, embrace, look for. You’ve heard the word “self-sacrifice.” The deeds and words of Jesus remind us that concept is divine. It is highly unfortunate that—dare I say—many fail to notice God’s immense and magnificent plans, divine plans of unfathomable love, astonishing beauty and radical, unparalleled goodness. Many walk through life as if in a drugged, subdued state, living in the shadows and passing from obscurity to obscurity, unaware of the brilliance and the light and the joy and the burning, fiery, infinite love of God. It is like residing in an astonishing, jeweled city, filled with streets paved in gold, surrounded by surreal mountains of untold beauty, but these sights go unnoticed because one never steps outside his cluttered, dingy apartment. The experience of the presence of God is for everyone—and it is worth dying for. I can say this because God desires all to achieve salvation and the Beatific Vision through faith in and obedience to his only Son, the glorified and resurrected Lord Jesus Christ. Further, Jesus thought the love of God was worth dying for. He died that you might enter into eternal life and experience the full love of God. He gave his human life as the gift of divine love. The experience of God! It is not something only for the next life, after passing through the veil of death. The kingdom of God is now, it is here and the gates are open. Our Lord Jesus, when he first began to preach, said these words: “Repent, the kingdom of God is at hand” (Mt 4:17). You can experience God right now, in unimaginable ways, if only you will repent, open your heart totally and unreservedly to God, thirst for God above all else, and walk the path of complete love of God. Avail yourself of the healing sacrament of Reconciliation, receive sanctifying grace, and begin a new life. Here is what must be done: you must choose to love God above all else; despise all sin; seek the grace and strength of God in prayer and through the sacraments; thirst for God as if you had not tasted water in decades; want God to the point of not only willingness to give your life for him but an ardent desire to do so. Do you want to find out what life is really about? More than that, do you want to live a fully human life as God intended it to be? Do you want a new life, the surprise and wonder of other-worldly experiences with God, and a real sense of purpose? Give up everything for God. Treat sin as a deadly poison; sacrifice whatever is necessary to live according to the commandments and in union with Christ. Live for the love of God! And, I might add, be Catholic! Do you desire, thirst for God to the point of wanting to die for him? If you do, then you’re on the right path. Get ready, God has unimaginable plans, a Divine-Dream is in store for you. The Divine-Dream is not something you can imagine, but it is something for which you were made, something that can be accepted only in docile love and humility. It is for the repentant sinner. It’s for the poor in spirit, the meek, the outcast, the humble and those in need. It’s for those who realize that God is everything and everything else is nothing. Christ taught his followers the prayer to Our Father. But it was not just a prayer to be recited. He actually taught us the attitude we should have. More than reciting we should ‘live’ the prayer then we will be truly acknowledging his death and ressurection. Now we become a true catholic.